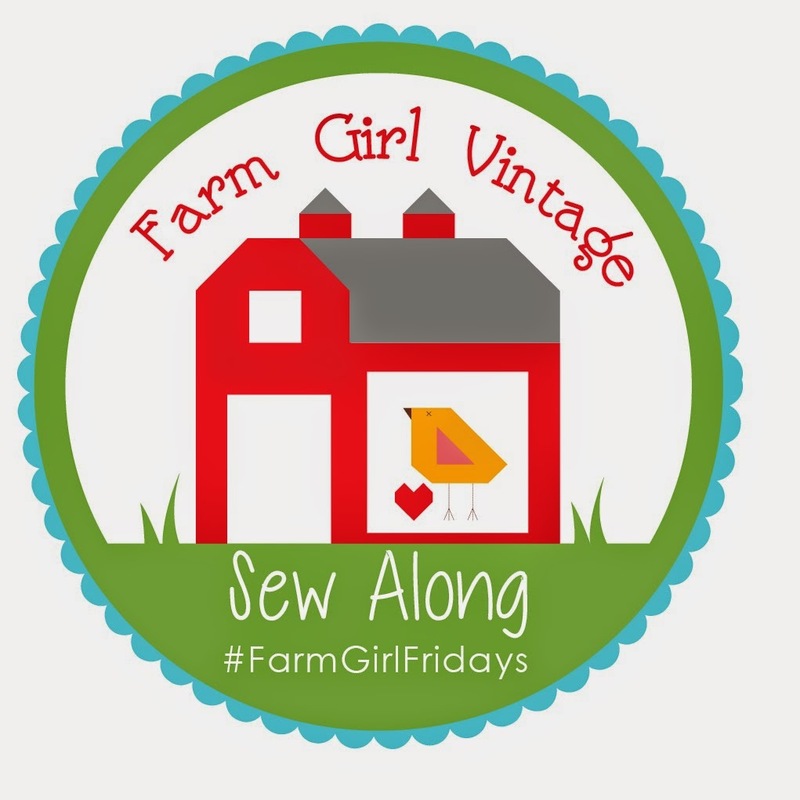 It's my day to show you what I made for this fun blog hop. I'm sorry that I only have one project. We had lots of time to create as many goodies as we wanted, but it just wasn't a great summer for creativity. 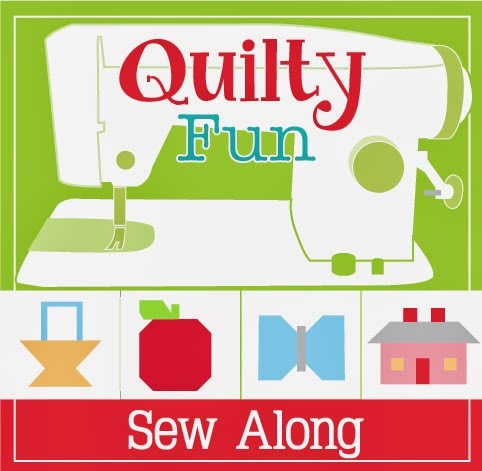 This hop was hosted an organized by Marian of Seams To Be Sew. Thank you for taking on the huge task of organizing this large hop and all of the hoppers. 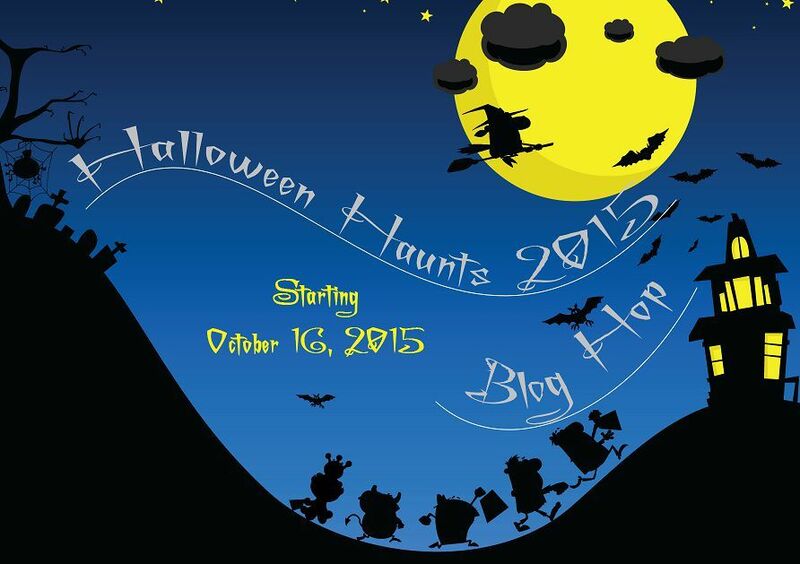 You can find the full list of participants on Marian's blog. Today's participants are linked at the bottom of this post. So here you have it....one project....but I took lots of pictures to make it look like more! Are you fooled?! I made a small hanging to fit my table stand and used an Amy Bradley pattern. It's from a whole quilt of different characters but I liked the ghost best. A little close up of the applique. I normally double the fabric on light colored fabrics so that you can't see through them. Because this was a ghost, I wanted that see-through look. Those creepy hands in the picture above came from the Dollar Tree. They are tongs...salad tongs....handing out candy tongs, whatever. I've got to tell you that they are actually really well made. They're solid plastic and, of course, only $1.00! I bought a couple of pairs to place around the house. Get em' while you can if there are any still hanging around the Dollar Tree! And what would Halloween be without a couple of pictures featuring the Sarducci Brothers?!! 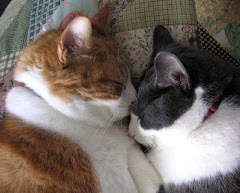 After all, Halloween is their favorite holiday. Rat riding.....the latest carnival attraction! 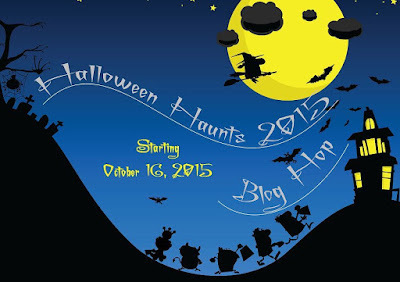 Please visit the other ghoulish crafters that are joining me today. Here's a list of today's participants and links to their sites. Gracie Oliver Arts-You are here!! And an extra bonus.....there is a daily giveaway sponsored by Fat Quarter Shop. Honestly, I had some problems with the link so I wasn't able to put it on my blog, but you'll find a Rafflecopter giveaway link on many of these other blogs. And a final note.......Have a happy, safe Halloween!!! Oh cute ghost! You did a nice job on him. Love the ghost! And the salad tongs -- that was a great find! Very fun patterns! Thanks for sharing these projects!! Well, it may be ONE, but ONE is enough when it's a great project. You have a wonderful sense of humor and knack for display too. Very amusing. Love the Sarducci brothers. Very nice project. The see-through ghost was a perfect choice! 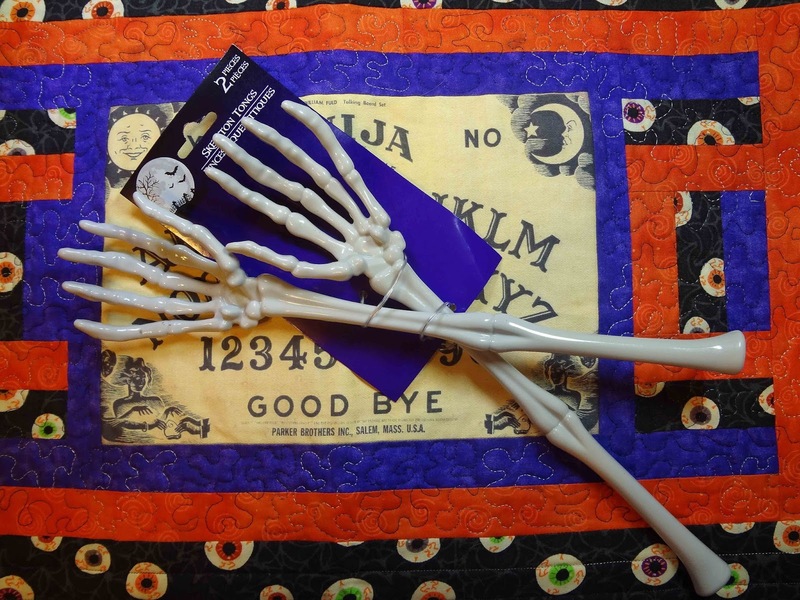 Love the mini ghost wall hanging! What a wonderful wall hanging ! This is one of those times that less in more, he is precious. Would you share where you got the pattern? I gotta find a table hanger too. I'v seen them but never wanted one before. If those Sarducci Brothers hadn't made an appearance I woulda been sorely disappointed. :) Now those Skull tongs are to die for, I so wish we had a dollar store, I'd have hopped right into my car.. But best of all is that ghost, that is to cute, and I love that the fabric shadows thru to the background, great idea, and technique. Your see-through ghost is so, so cute and seeing those Sarducci's being naughty is too funny! Cute Ghost! 👻 I Love The Creepy Hands Too! That is so cute. Love the eyeballs.Those tongs are pretty cute too. He is so not terrifying, I love him. The brothers on the rat are a great addition to this wonderful Halloween post. Oh my gosh! The frog riding the rat - hilarious!! 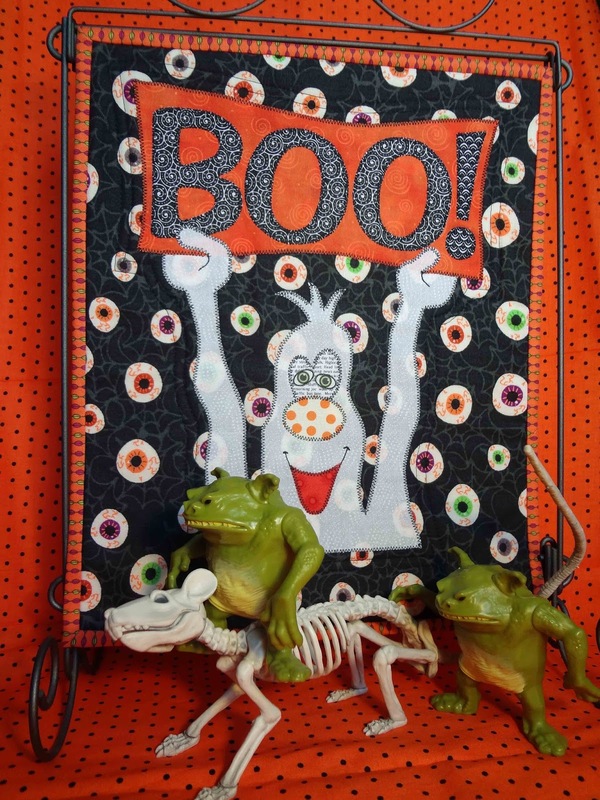 What a great little wall hanging to welcome all your BOO-tiful guests! You did a wonderful job! Those skeleton hands were perfect for your pictures! What an adorable ghosty guy. Amy Bradley has the most adorable designs. Love how you have made him your own and the transparent look is perfect. I think I have to check of the dollar tree. Love those salad tongs! Awe your ghost is cute! I need to see if our dollar store has those tongs. That ghost is too cute to be afraid of! NEAT HALLOWEEN IDEAS! 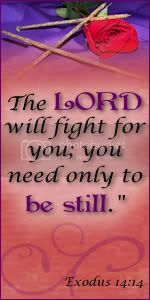 THANK YOU FOR THE BIBLE VERSES TOO! If you had to choose one project you picked a perfect ghost. Sweet, spooky ghost especially with his extra hands. Happy Halloween. Great wall hanging. I love the eye ball fabric you used in the background. Perfect. I love the ghost. So much fun! I like that your ghost is goofy and not scary. Love the unique ghost you'f shared. Very cute. Love his fun googly eyes! Cute ghost would love to make a wall hanging with the ghost! Your ghost looks like a very gentle boo ghost. I'm not sure about the salad servers/back scratchers though. I expect they'll be turning up in all sorts of places. 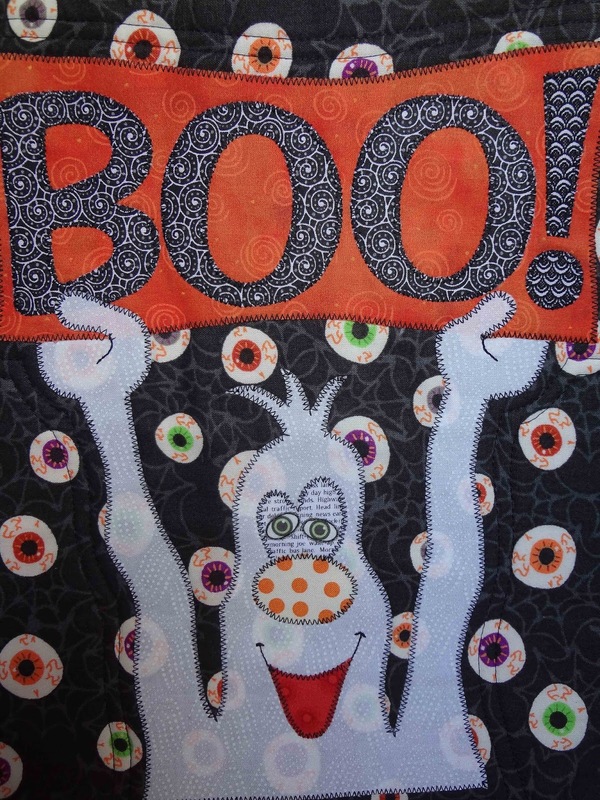 Cute little quilt and I love your ghost, and the text fabric for his eyes is great. Great little BOO Quilt - love the fabric choice for the ghost - great choice. Love the see-through aspect of the ghost. I would not have thought of that. I laughed to see the Sarducci brothers again. Looks like they are having fun. Thanks for sharing your project. Very cute! I like the eyeball fabric. Thanks! Very cute little ghostie quilt! And those salad tongs are very fun looking, I will have to see if they still have them here. Love your idea especially the hands. I love that the ghost is see-through! Perfect! The ghost is the cutest one I have seen in a while. Perfect for a new Halloween project. Your ghost is just too cute! I love him. Love those "hand" tongs too. Headed to the dollar store to see if they have them here. P.S. I must be so out of the loop because I don't know who the Sarducci Brothers are??? Love the ghost! So cute for Halloween! Such a cute wall hanging. I love the salad tong hands. Cute wallhanging--perfect to be able to see thru the ghost! OMG, I got such a giggle when I saw your "rat" ride. Too funny! Love your ghost mini quilt. Great choices of fabrics!! Cute mini quilt! I especially like his nose. Thanks for sharing. OK - that ghost is super! 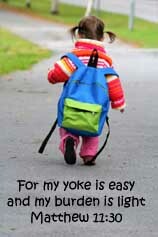 It just made me smile - ha! You are very clever to keep your ghost "see-through"...of course he should be! He would be very welcome in my home hanging on my wall! 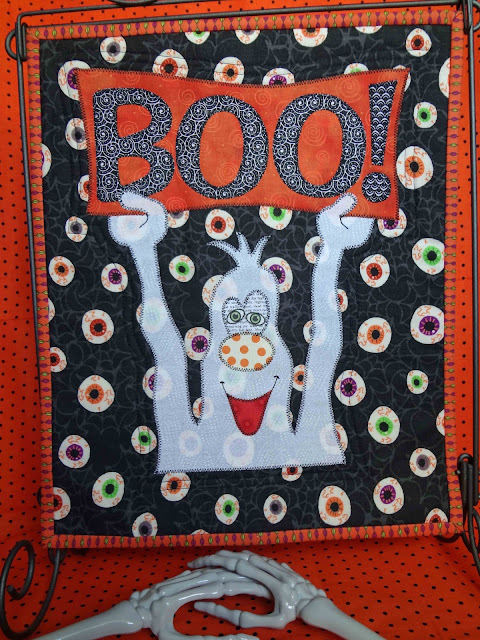 You did a great job on the BOO quilt! The ghost looks suitable wispy. The dollar store hands are creepy! I must see if there are any left. I love Halloween quilts. Thanks for sharing. Love the idea of leaving the ghost kinda see-through. 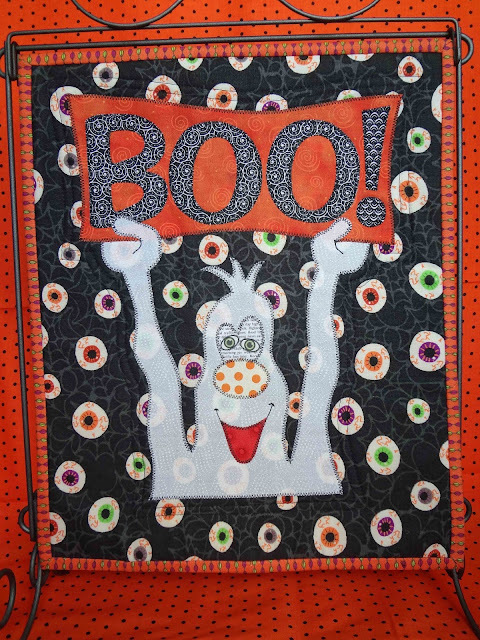 Love the little ghost quilt and the eyeball fabric is great! I've got to go get me some of the skeleton hands asap! Adorable quilt!! Been wondering what you were up to...missed reading your blog! Your project is great and I love the presentation! Oh, he e is so cute! I am soi happy the hops are slowly coming back. I missed reading and seeing all the great projects. You blew this one out of the park! So fun! I love that you kept the ghost see through, adds to the spookiness! Being able to see through your ghost was genius ! Very cute mt friend....I see you still have those greeeeeen critters around ! Oh he is cute! Love that he is see through! Your ghost is a cutie...and I love your "see-through" idea!! I love your ghost and all of the fabrics you used! 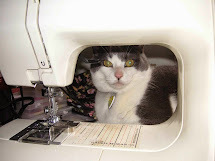 I learned to sew when I was 4 years old. My dear Aunt Billie, now with the Lord, taught me how to make a simple pillow slip on her treadle sewing machine. Who knew that would be the beginning of a lifetime of creativity! THE CALL CAN WAIT UNTIL IT'S SAFE! FYI.....Most, not all, of the photos in my blog may be enlarged for better detail by clicking on the photo.